La. Governor Sued Over State's Alleged Failure To Provide Lawyers To Poor Defendants : The Two-Way A lawsuit filed Monday describes defendants waiting months in jail before meeting a lawyer, and some defendants who don't get a lawyer at all. Similar suits are underway in at least six other states. 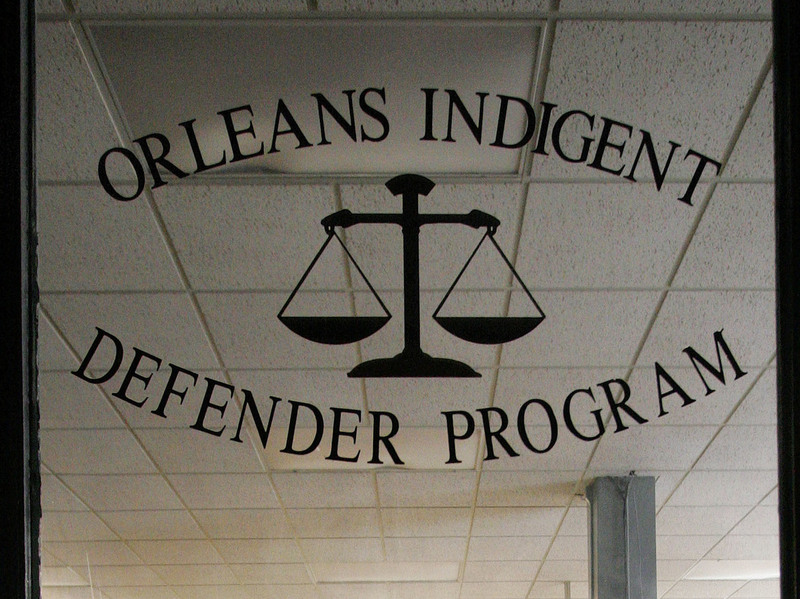 A new lawsuit alleges the public defender system for the the state of Louisiana has failed to provide effective representation to poor people. Louisiana Gov. John Bel Edwards was sued Monday over his state's public defender system, which plaintiffs say violates the U.S. and Louisiana Constitutions by denying effective representation to poor people accused of crimes. The lawsuit filed in U.S. District Court describes defendants kept in jail for months before seeing a lawyer, public defenders who are so overworked they cannot provide adequate counsel and multiple instances in which people accused of minor crimes did not receive an attorney at all. Similar lawsuits are active in Florida, Michigan, Missouri, Utah, Idaho, New York and other states, Dan Kolb, a partner with one of the law firms involved in Monday's filing, told The Associated Press. The latest suit was brought by The Southern Poverty Law Center, the Lawyers' Committee for Civil Rights Under Law and two law firms on behalf of 13 criminal defendants. One, Joseph Allen, has been in jail since Aug. 28, 2016 facing firearms charges. In the more than five months he has been incarcerated, Allen has met with his public defender once, and the suit alleges the attorney "was so careless" with a motion on Allen's behalf that the motion "referred to the wrong case and discussed a search warrant that had no relevance to the charges against Mr. Allen." Another plaintiff, Ashley Hurlburt, has been held in jail since June 6, 2016, and said she has never met the public defender appointed to represent her more than three months ago, and has "no way of contacting him." She and her husband are facing a negligent homicide charge for the death of their one-year-old child. In addition to the 13 plaintiffs listed on the lawsuit, the lawyers' groups are seeking class-action status, which would cover all indigent defendants accused of non-capital crimes in Louisiana. Kristen Clarke of the Lawyers' Committee for Civil Rights Law told The Associated Press that as many as 20,000 defendants could be affected. The suit comes just over a week after a federal judge dismissed a similar lawsuit brought last year by the American Civil Liberties Union against the New Orleans public defender's office, as we reported. In his decision, the judge in that case acknowledged "the undisputed inadequacies of a state funding system," but said that the funding crisis was not his court's responsibility, according to The Times-Picayune. The chief public defender in New Orleans told NPR's Audie Cornish last year that budget cuts had led his office to stop taking some felony cases. "It is clear that the Louisiana legislature is failing miserably at upholding its obligations" to provide lawyers for defendants unable to afford private counsel, the judge wrote in his decision dismissing the ACLU's case. "Budget shortages are no excuse to violate the United States Constitution. The legislature must resolve the crisis and locate a stable source of funding." The latest lawsuit approaches the same problem in a slightly different way, suing state officials, including the governor, on the grounds that Edwards and other state officials control funding for the entire public defender system. "In 2016, at least thirty-three of the forty-two public defender offices stopped accepting cases or placed clients — many of whom were incarcerated — on waiting lists for extended period of time. In stark contrast, district attorneys often receive more than twice — and sometimes three or four times — the funding for public defender services in the same district. In Orleans Parish, the District Attorney has historically had a budget more than twice the size of the Orleans Defenders. "The level of funding for each district office depends primarily on a user-pay system of local fines and fees and, as such, varies widely based on geography and the number of traffic tickets written in a particular judicial district in any given year. No other state in the United States relies primarily on local court fees and fines to fund public defender services." An NPR investigation found that Louisiana's system was symptomatic of a national trend. As of 2014, an NPR survey found most states allowed poor defendants to be billed for their public defender, and those who could not afford to, or chose not to, often ended up incarcerated for failing to pay fees or keep up with terms of plea agreements they agreed to without the guidance of an attorney.